Trade shows have become popular events happening several times throughout the year. Nowadays, a trade show is special for any brand looking to deliver the main idea behind it. That is why a special presentation is beneficial, in which the clothes also take part. What to wear to a trade show? Is there a special fashion guru guide? First of all, you should check the local weather. Whether it’s a long trip or just a few miles nearby, being professional at a trade show event means following the weather. After all, April in Wisconsin is not the same as April in Arizona, so packing your clothes should be done accordingly. An umbrella is always a necessity, especially if the convention hall is a far away walk. Dressing in layers is our second tip for you, making you stay comfortable even when the temperature varies. Layers will make you cool and will give you the functionality to adapt on every part of the day – whether it’s the early morning, the noon or the late night. That is why jackets, sweaters and cardigans are always a must. 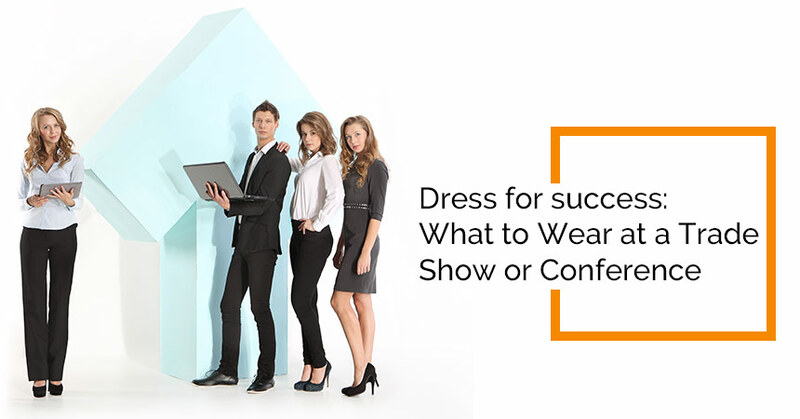 Possibly the most important aspect of fashion at a trade show is the fact that you must wear comfortable clothes. The level of professionalism should however be maintained within your industry demands, but what doesn’t give comfort on you won’t give you the comfort to lead the presentation of your business. Representing your company is important today, even on your feet. That is why wearing comfortable shoes is yet another part of the ‘dress for success’. Trade show displays in San Diego (CA) usually demand a lot of standing on the feet, and that is exactly why your shoes must come with comfort soles and cushioned socks. In the end, to top off the whole look, you must consider a name tag for any of the trade show displays throughout the country you may take part in. Apart from the fact that a name-tag is your ticket to the event, you should also know that with sharing your name to a visitor, you are being clear about yourself and the way you are representing your company. Stay comfortable and make the most out of your trade show display! Dress to impress, but more importantly – dress for success!